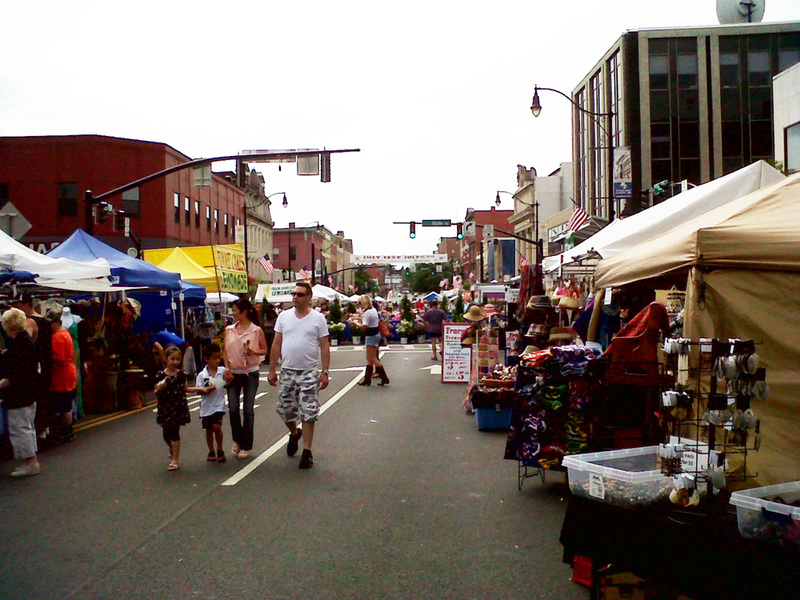 Binghamton July Fest 2013 — what a hoot! 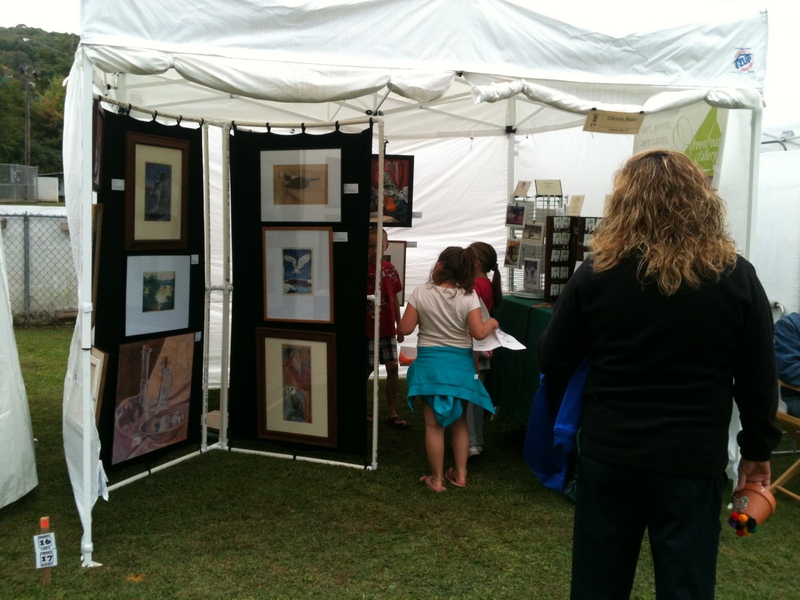 The original art side of my July Fest booth (not shown: cards, prints, and earrings). Photo thanks to Angela Cook. 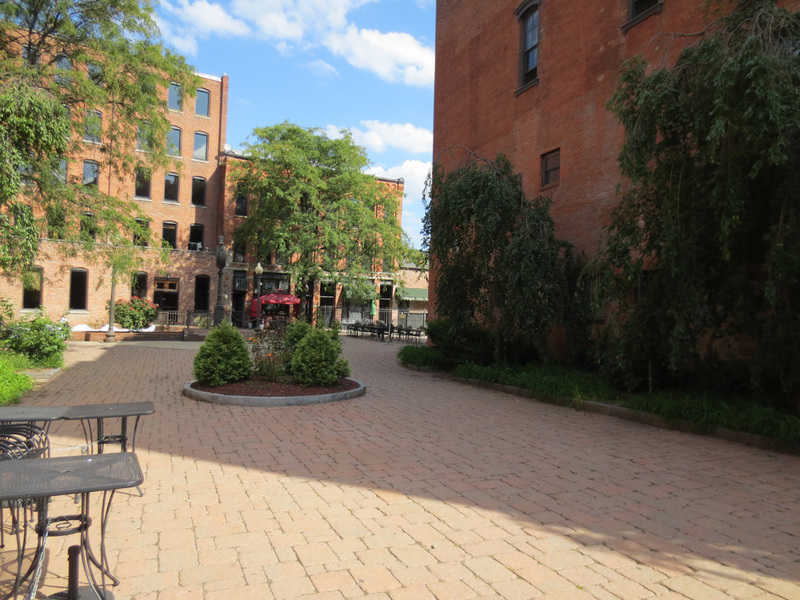 It’s Wednesday, and I’m just now recovering from last weekend’s July Fest, the 51st year of Binghamton, New York’s downtown music, art, and community festival. What a hoot it was. Not a terribly profitable year for me or for many of those around me — though it was wonderfully so for a couple of my artist friends. But for many of us it’s as much a social and networking occasion as it is a sales venue. There were people from my high school class (FAR too long ago), Facebook friends I’d never actually met before, people who’d bought my work before, and many who hadn’t but loved it. 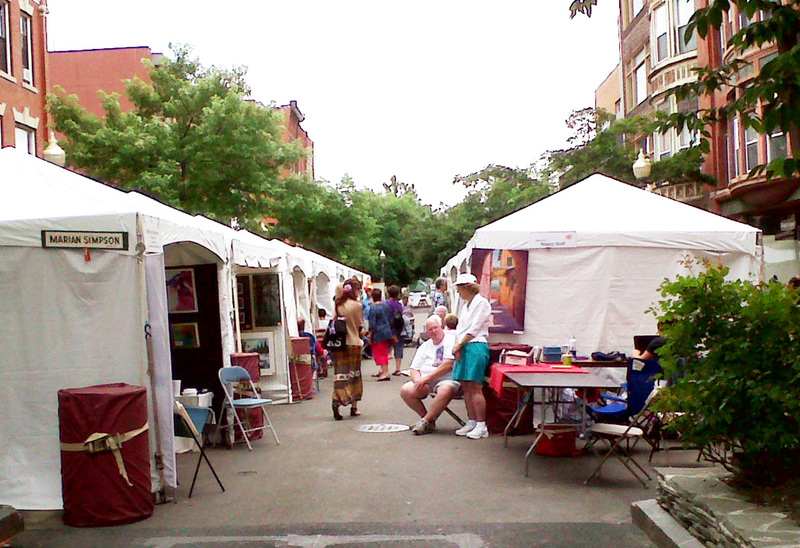 There were artist-friends and “neighbors” old and new who were both good company and mutually supportive. Dogs and children I adored and/or pitied. An appalling number of very fat people. Stressed-out but accommodating and helpful organizers (including Ron Sall, July Fest coordinator, who is every July Fest artist’s best friend). 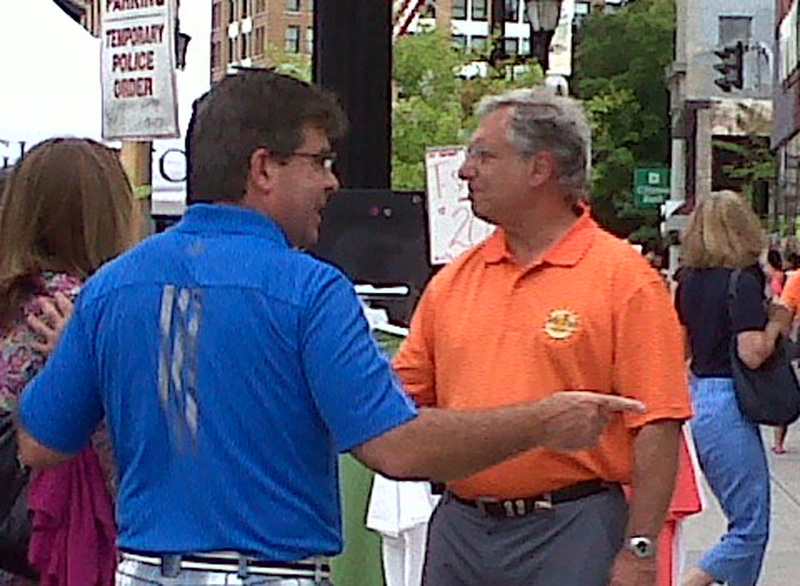 Ron Sall (right, in orange shirt) is the guy who pulls it all together. 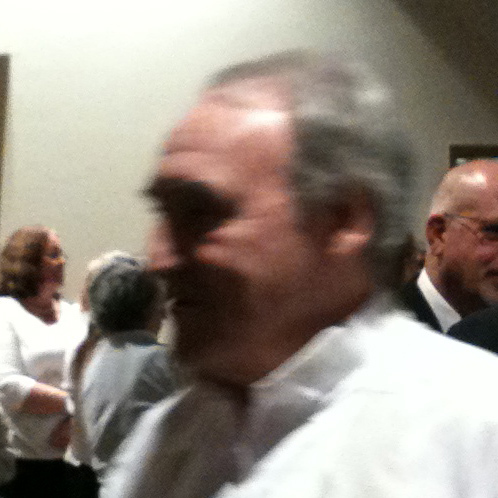 He well deserves the 2012 Heart of the Arts Award he received from the Broome County Arts Council! Photo thanks to Patti Schwartz. The weather was hot, on Friday and Saturday, but brutal on Sunday. I had to leave early on Sunday anyway, due to a timing conflict with the Opening and Awards celebration of the Roberson Regional across the river, and although I hated abandoning my friends and the show, and disappointing Ron as well, I wouldn’t have been able to take the heat for much longer in any event. Thanks again to my volunteer “porters,” a lovely last-minute customer and two old dance friends who helped me haul all my stuff to the car, and of course to my sweet husband who leapt up at my last-minute phone call to come downtown and take my largest painting home separately so it wouldn’t get damaged. That large painting was Unlikely Dance: Entry Hall (visible at right in the photo at the top of the page), which got some rave reviews — including one from Marion Simpson, who is not known to give praise lightly, and another from Nancy Goff, whose own work I so admire. Pretty heady stuff! It was altogether exhausting, and on Monday I was apparently still running on adrenaline when Mary Robertson and I met to re-do our storefront exhibit at 97 Court St. We were — almost literally — bouncing off the walls with laughter and fatigue. On Tuesday afternoon I fell over for the rest of the day. Next post on the Roberson Regional opening and show — a remarkable exhibit — but I’ll wait for that until next week, when I’ll have some photos to post. 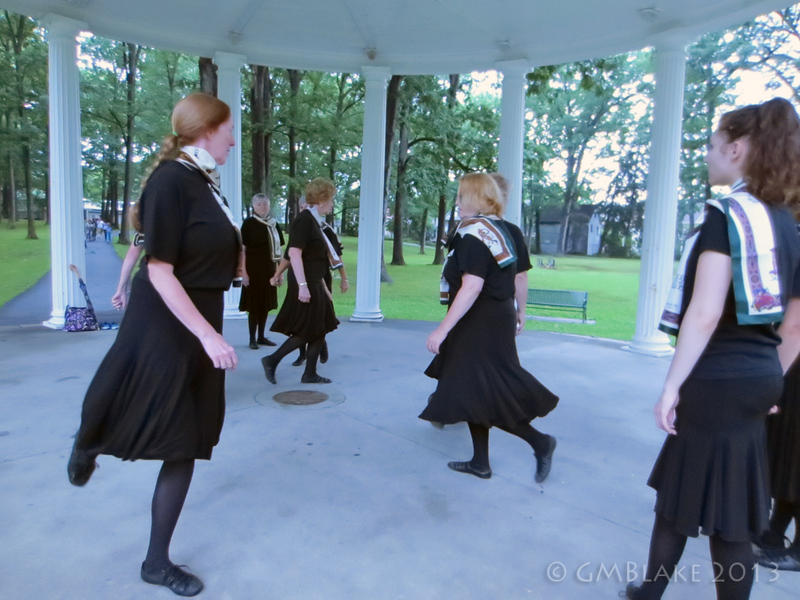 Last evening, in the heavy summer heat and humidity that’s settled over the Binghamton area, I photographed a women’s dance group called the Ballyclare Irish Dancers. What fun! It was all I could do to not start jigging myself, though my jigging experience — what there is of it — is in the English Morris tradition rather than Irish. All shapes, sizes, and ages these women were — and all of Irish descent/heritage — and how wonderfully they danced, in their simple dance kits of black knit skirts and tops, black stockings, and Celtic-pattern neckscarves. This is the real stuff, to me — not the costume-y children’s competitions. The joy of dancing was contagious, even in that oppressive air, and I got a lot of material to work with on my next Unlikely Dance piece. 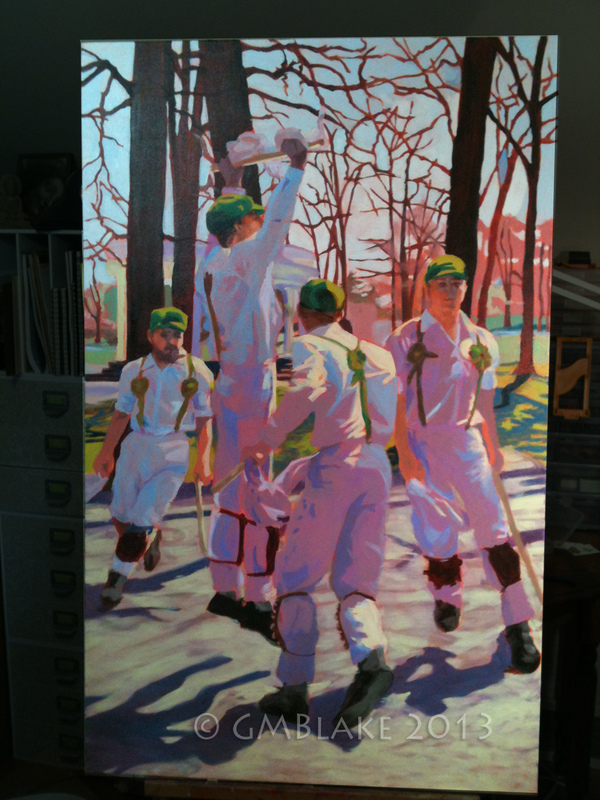 But here’s a dilemma — the current piece on the easel, Beethoven Oaks, is set in Recreation Park (though I photographed the dancers in Gilbertsville, NY), and the neo-classical bandstand is visible in the background. Last night’s shoot was IN the bandstand, and the setting is lovely. So far each piece in the Unlikely Dance series is in a different Southern Tier location — Green Skirt in The Forum, Golden Clouds on the street in Johnson City, Entry Hall in the Phelps Mansion Museum, and Beethoven Oaks in Recreation Park. (See the first three together at the bottom of my Unlikely Dance page.) WHAT shall I do with the Irish dance piece? Speaking of Beethoven Oaks, I’ve been slowed down a bit lately in pulling it together, but I’m very happy with it so far. Hoping to have it finished in time for Binghamton July Fest, July 12-14. Jo Malin of the B.F. Harridans, the Binghamton women’s morris dance team, alerted me beforehand that they’d be dancing at the Newark Valley Apple Festival on October 6, and I managed to find them (unlike their previous dance stand, when I managed to miss them altogether) and to take some pretty useable photos. 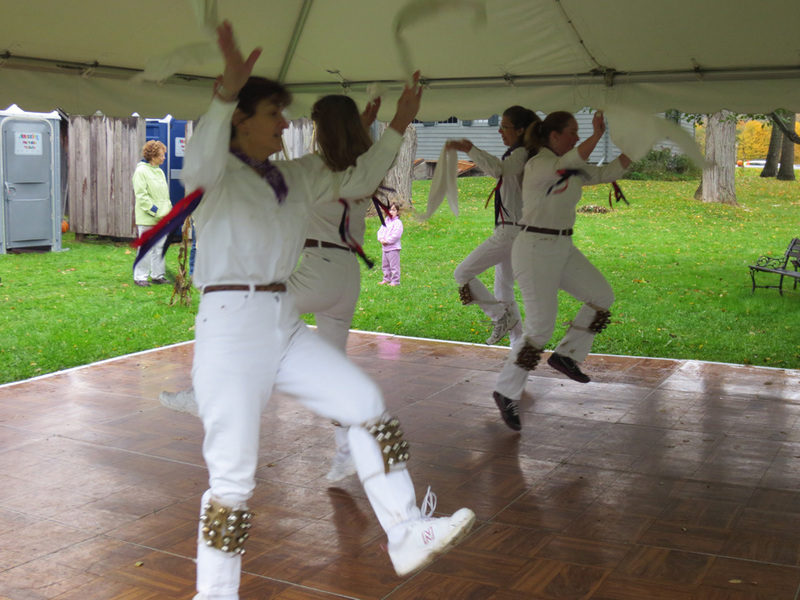 Wish I’d had the fast-burst function figured out for that one, and that the light had been better — it was a typically chilly, rainy October day, and they were dancing under a tent roof. Strange lighting, but I’m working one of the photos — with some major adjustments — into a composition with storm clouds I shot earlier in the week. light set up to duplicate dance settings, and will patch in those heads during the digital composition process. Hope this will fly with the BCD folks — the Scottish Dancers thought it was fine. 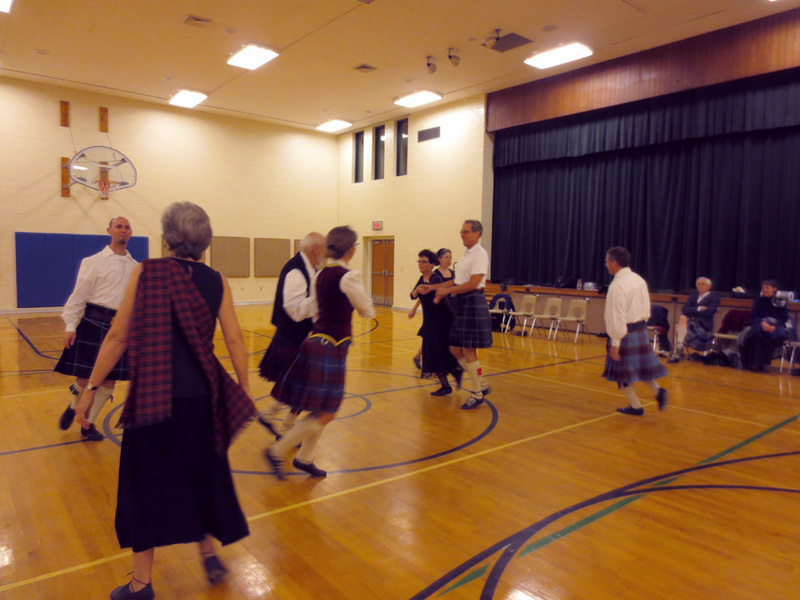 And back to those Scottish Dancers — thanks to one of the dancers there, it looks like I’ll have a venue for showing the finished Unlikely Dance series, January through March, 2014, at the Tompkins County Public Library! This is very exciting, and I’m so grateful. In the meantime, I hope to start actually painting UD by mid-November. Because of negative feedback and interference I’ve received regarding this project, I will not be informing the public of any progress on this painting. The Flickr group I reference below is now closed to the public. I regret any concern I may have raised, but reserve the right to paint whatever and whomever I will, in the privacy of my own studio. I’ve sung for a number of years with Alan Crabb, in the Binghamton Downtown Singers and the Sarah Jane Johnson Memorial UMC choir, Johnson City NY. Last week, Alan died, at age 70, and tomorrow I’ll be singing at his funeral, with the rest of his Downtown Singers. It’s so hard to believe he’s gone. Please help me in collecting photos and videos of Alan, for my use in the composition of a commemorative/interpretive painting of him. As an artist, this is my way of both mourning him and honoring his memory. I’m especially interested in photos of Alan conducting. The portrait will not be a direct copy of any one submitted photo. One way to contribute digital images of Alan is by uploading them to the Flickr group I’ve established especially for this purpose. Or you can post them on Facebook, and tag them with my name. I also gladly accept images via CDs, DVDs, and email, as well as hard-copy prints. You may mail them (contact me for the address), or I’ll pick up locally, and will return your hard-copy photos after digitally scanning them. I’ll give you a copy of the scanned file as well. Thank you, for your interest and any help! 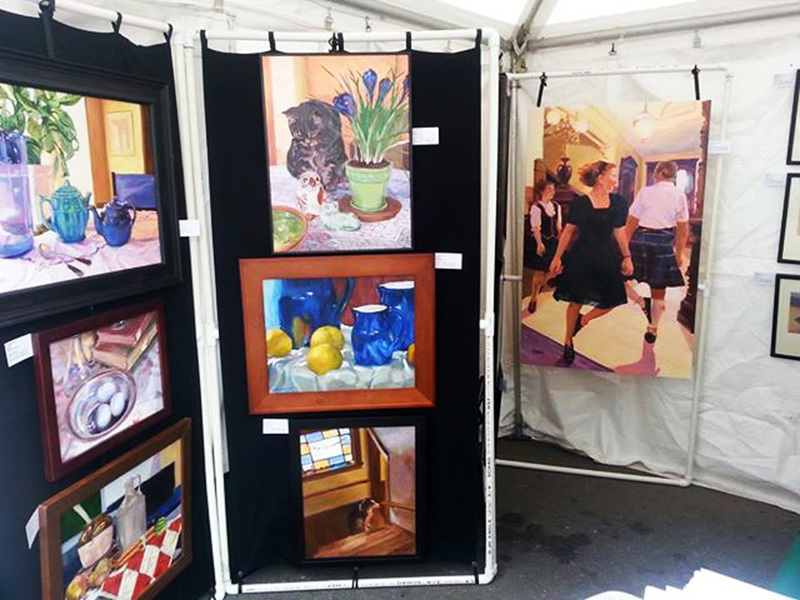 This is a personal project, and not under the auspices of, or approved by, the board of directors of the Binghamton Downtown Singers, Inc.
Saturday’s Window on the Arts Festival was a smashing success, both for the festival itself and for me personally. I was a bit concerned about how large (or small) a crowd it might draw, with this year’s relocation away from the central town square to a nearby but not-so-central park; and the night before, the winds and rain came crashing down on the early set-up gazebo tents (mine amongst them). 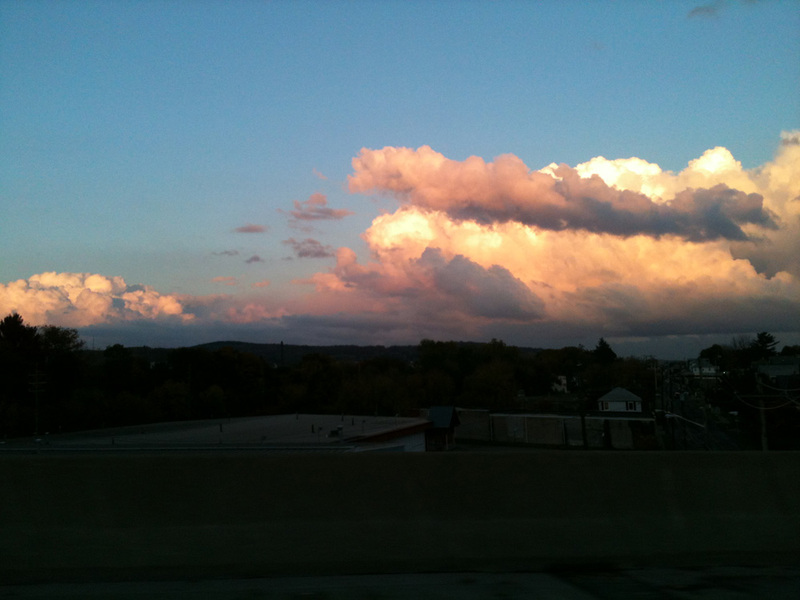 However, the local Binghamton newspaper had given the festival the front cover of its Thursday “Good Times” supplement, the Friday night storms stopped in time, and all began — and continued — well. a pastel piece of last year’s flooding Susquehanna River. And beyond the sales, everyone wanted to interpret and discuss the art. I just love hearing people’s interpretations of some of my images, especially when they’re not speaking directly to me. “Oh, look,” said one man to his wife about Window, “it’s a cat looking into a mirror, and he sees himself as an owl.” Wow. That’s the one that’s stayed with me. In the early afternoon, Sweetie brought food, the dog, and a break (after calming me down and packing the car for me in the morning — not to mention helping me set up the gazebo tent the night before). 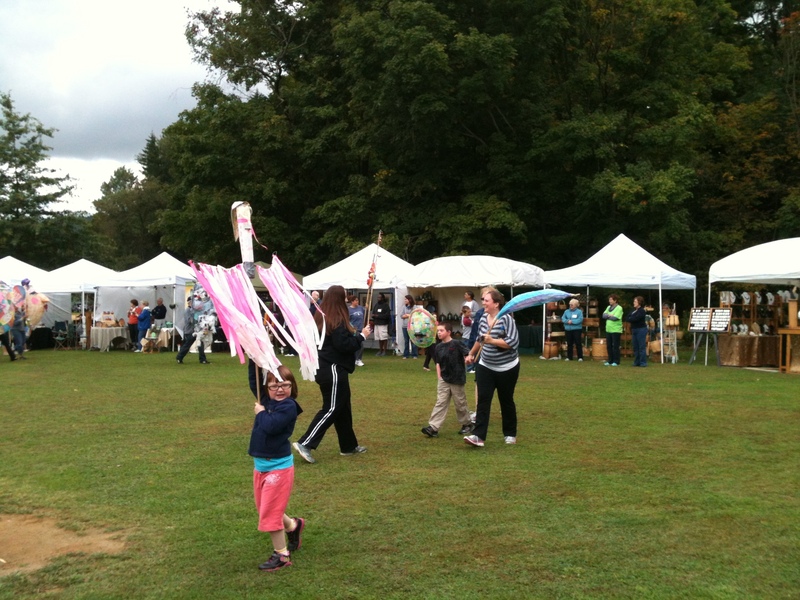 We were both impressed by the quality of the arts and crafts there, as well as the quantity of fifty artisans… and Sweetie is not easily impressed! As I walked around the festival on my break, he took over the sales for a while but called my cell phone, after checking Facebook on his phone, to tell me that Alan Crabb had died. It was not unexpected; Alan had been in the UPenn hospital for a couple of weeks, suffering open-heart surgery and severe complications after a risky heart procedure, but it was still a shock and a sorrow. 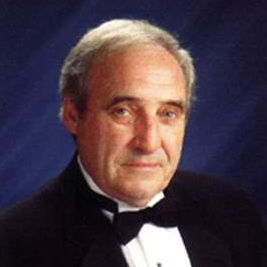 He was friend and maestro to so many, a beloved high school music teacher in his working years not so very long ago, a gifted world-class tenor, and one of a kind. He was a manic, maddening, arrogant, rude, distracted, and self-centered Welshman with an aura a mile wide: a demanding but gentle mentor to all who sang under his direction, a warm and loyal friend — father of two adult sons from his first marriage (to the first — and so far only — woman mayor of Binghamton) and of a two-year-old son from his recent second marriage to a lovely young violist. Sunday, I felt consumed by exhaustion and grief, and laid low for a day. Rest in peace, Alan Crabb — 1942-2012. This week I have several projects to start or continue: finish unpacking the car (and clean it), mat and frame my two entries for the upcoming Rude and Bold Women show, get back into the new still life (calling to me now from its easel across the room…), replace the traded-out still lives in the Acme exhibit, design and build the Acme business window, photograph contra dancers for Unlikely Dance, sing Diamonds in the Rough‘s “Eldercare Tour,” and — as if that’s not enough — start a call for images of Alan, with which I plan to build a commemorative/interpretive painting of him. More on that next. For my birthday earlier this month, my sweetie gave me a day ticket to the Philadelphia Folk Festival, about three hours away — he’s not crazy about either folk music or festivals, but his sister Ghislaine in Philadelphia is, and he bought her a ticket too. I invited my museum-and-music buddy, Judy, to make the trek with me, and, last Friday morning, off we went. Our hopes to see the new Barnes Museum were quashed by the wait for reserve tickets — now into October, unless one wants to go for a half hour in the evening — so we set course for the Philadelphia Museum of Art and their current show, “Visions of Arcadia: Gauguin, Cezanne, Matisse.” After a few wrong turns, unintended tours of the ghetto, etc., we arrived mid-afternoon at the museum. It was a wonderful exhibit, with works by many more than the three named headliners. The Arcadia theme was quite a clever umbrella for the collection, and worked well, I thought. Thrilling to see Gauguin’s Where Do We Come From? in person — the thing simply glows with light and presence. I liked some of the smaller Cezanne bathers, but the Large Bathers was a ho-hum for me. Call me a philistine. What really captured me was the work by Pierre Puvis de Chavannes, an artist I was only tangentially aware of from art history in college, primarily for The Poor Fisherman, which — I am grateful to report — was not here. His Arcadian-theme work was a revelation: pale, mystical, ethereal, pristine yet sensuous — and somewhat self-consciously Grand — obviously influenced by classical Greek and Roman statuary and the frescoes of Piero della Francesca, they were the pieces that drew me back through the show. It was all dreamlike, spirit-lifting work, and a fine show altogether. Ghislaine and her daughter Ahisha met us after work hours for dinner in Manayunk — and the next day we were off to the folk festival, supposedly a half-hour away. Excitement again ensued — bridges out, detours, truly “remote” festival parking, non-existent shuttle buses (you’d think the flawless organization of a 51-year-old festival would be a given, but such was definitely not the case; kudos to Ghislaine for talking the organizers into upgrading our tickets! ) — but with a lot of laughter and minimal whining we eventually made it there by late afternoon, missing a couple of the acts we’d wanted to see but catching a couple of them as well. One of my “must-sees” was Steve Earle. I’d never heard or seen him, but his song “My Old Friend the Blues” is a favorite in my trio‘s repertoire. He did not disappoint. 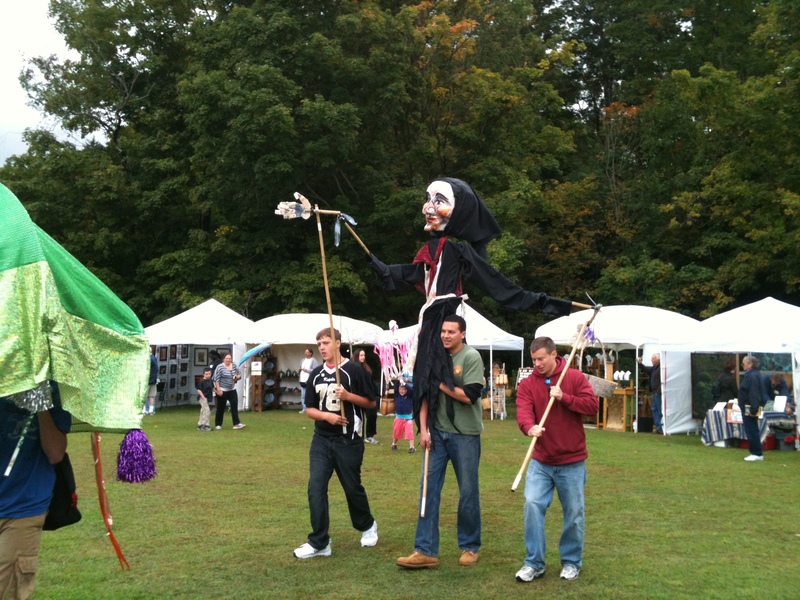 As Ghislaine said, just before we headed back to find a shuttle bus, he alone was worth the price of admission… along with the fabulous Nag Champa body butter I bought in the arts & craft stands from BAMI products. I now smell like a particularly delicious incense shop. Left my sketchbook at Ghislaine’s, but I have others and she’s promised to send it back… and the 3:00 a.m. fire alarm/evacuation of her apartment building added to our growing travel log as well as the general sleep deficit. A stop at IKEA, then a drive home, blessedly free of further adventures… yawwn. Glad to be home. Still recovering. Still aglow. 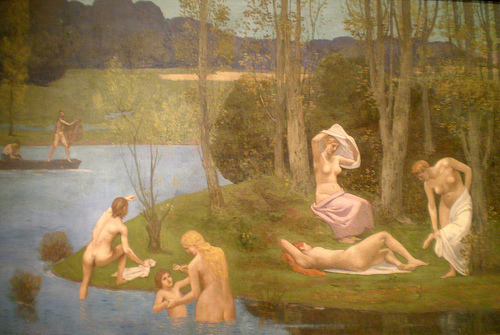 Must find out more about Puvis de Chavannes.